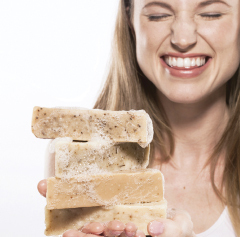 Nearly a year�s worth of creamy, delicious hand-poured soaps made with ingredients from U.S. farms! 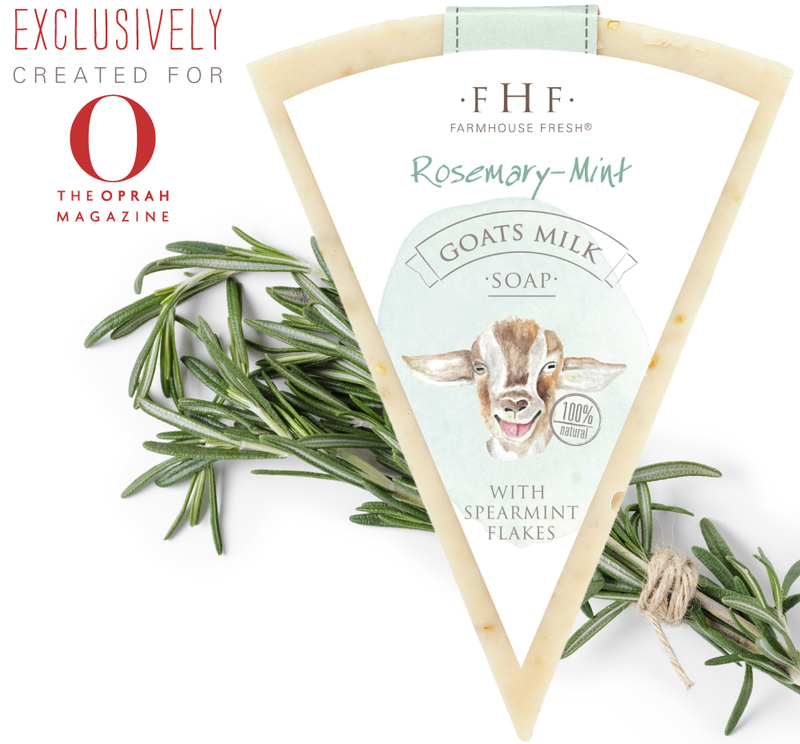 This O-Magazine Limited Edition Gourmet Milk Soaps set contains artisanal, fine-cheese inspired Whole Milk and Goats Milk Soaps made with U.S. farm milks, herbs, honey, oats, nuts, and berries. 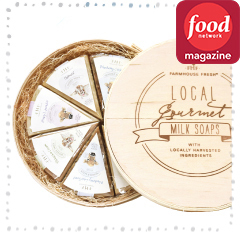 Each gift set contains four varieties of soaps � a total of 8 wedges formed like a cheese round, placed inside a hand-crafted, Wisconsin-made, Aspen wood cheese box with lid. From juicy apple with honey to luscious rosemary with uplifting mint... enjoy all four varieties! 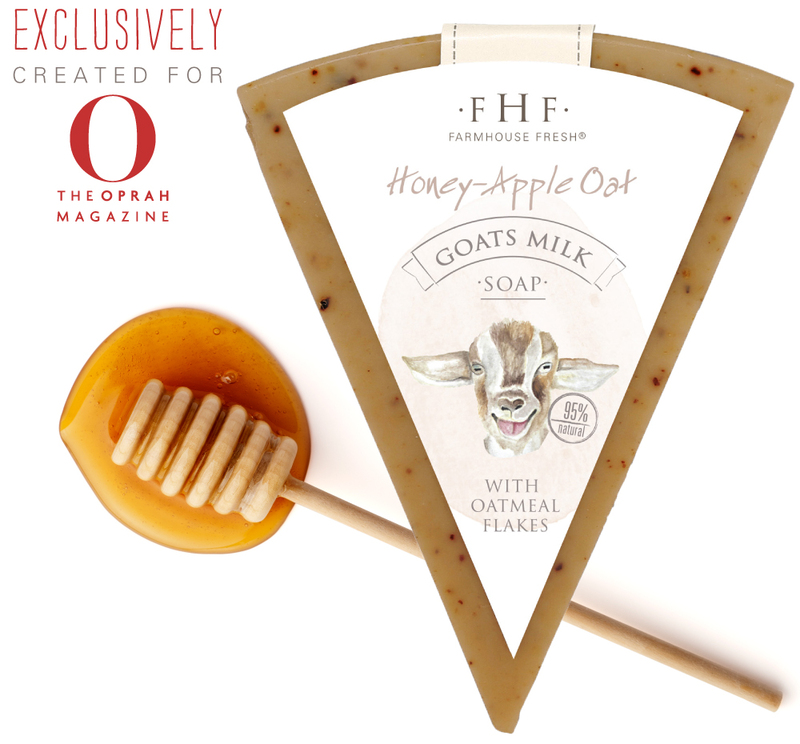 - Honey-Apple Oat Goats Milk Soap - features Texas honey, Michigan apples, certified organic oatmeal from Kansas, and goats milk from California. - Rosemary-Mint Goats Milk Soap - features Spearmint leaves from Washington, Spearmint oil from Oregon, and goats milk from California. 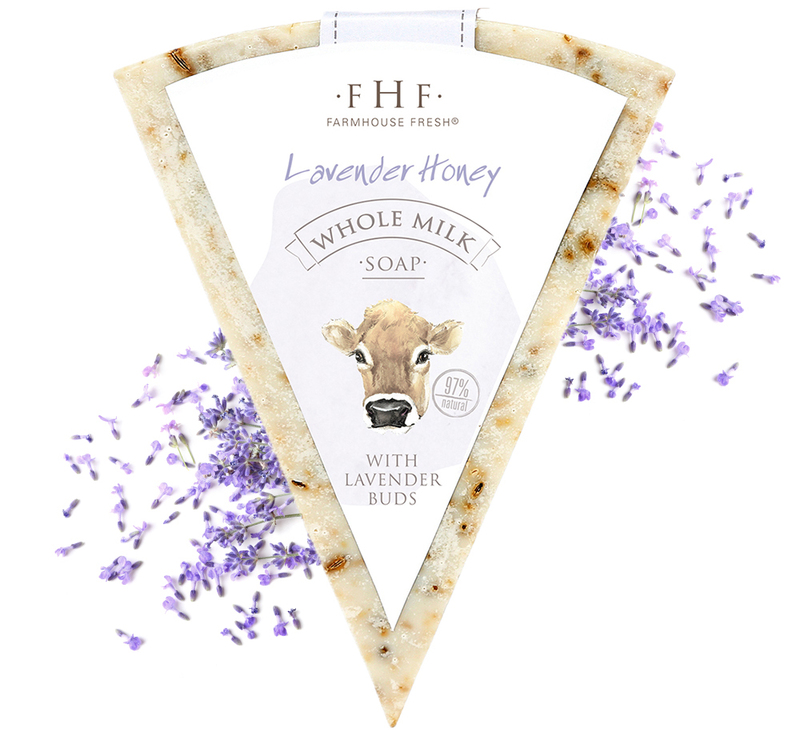 - Honey Lavender Whole Milk Soap - features Texas honey, whole milk from the Midwest, and Washington lavender. 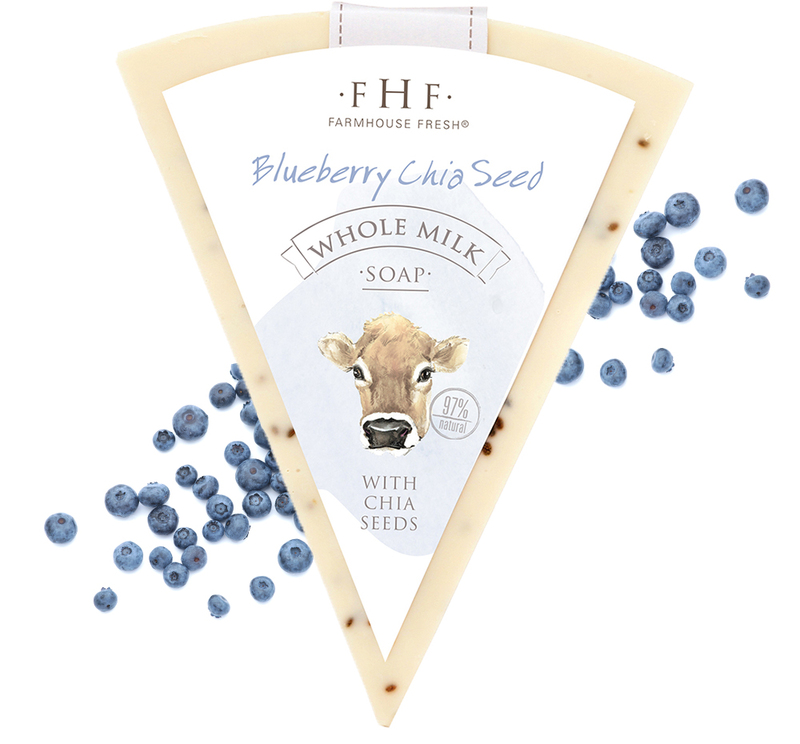 - Blueberry Chia Seed Whole Milk Soap - features blueberries from Oregon and whole milk from the Midwest. Certified organic oatmeal from Kansas. HONEY-APPLE: Saponified oils of [Olea Euopaea (Olive) Fruit Oil, Cocos Nucifera (Coconut) Oil, Oryza Sativa (Rice) Bran Oil], Water/Eau, Parfum*, Goat Milk/Lait, Pyrus Malus (Apple) Fruit, Rice Flower, Honey/Miel, Avena Sativa (Oat) Kernel Meal Certified Organic. *All Farmhouse Fresh fragrances are phthalate-free. ROSEMARY-MINT: Saponified oils of [Olea Euopaea (Olive) Fruit Oil, Cocos Nucifera (Coconut) Oil, Oryza Sativa (Rice) Bran Oil], Water/Eau, Parfum*, Goat Milk/Lait, Mentha Viridis (Spearmint) Leaf Powder. 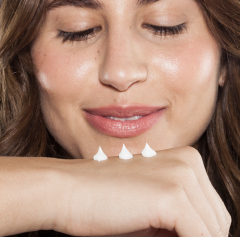 *Natural fragrance derived from 100% natural sources. LAVENDER-HONEY: Saponified oils of [Olea Euopaea (Olive) Fruit Oil, Cocos Nucifera (Coconut) Oil, Oryza Sativa (Rice) Bran Oil], Water/Eau, Parfum*, Milk/Lait, Honey/Miel, Lavendula Angustifolia (Lavender) Buds. *All Farmhouse Fresh fragrances are phthalate-free. BLUEBERRY CHIA SEED: Saponified oils of [Olea Euopaea (Olive) Fruit Oil, Cocos Nucifera (Coconut) Oil, Oryza Sativa (Rice) Bran Oil], Water/Eau, Parfum*, Milk/Lait, Vaccinium corymbosum (Blueberry) Fruit Certified Organic, Salvia Hispanica (Chia) Seed. *All Farmhouse Fresh fragrances are phthalate-free. Suitable for all skin types. Blueberry Chia Seed soap contains chia seeds for exfoliation and may not be suitable for sensitive areas. A HARRIED HOSTESS WILL BE A HAPPY DAIRY QUEEN WHEN YOU HAND HER THIS LIMITED EDITION SELECTION OF UNIQUE MILK SOAPS.